One of the most frustrating things that happen in art licensing is that a manufacturer asks an artist to send them specific images, the artist hurry's up and sends them, and then the artist does not hear back from the manufacturer. This is especially true for artists exhibiting at Surtex and other licensing trade shows. The artist gets many requests for art but few if any licensing deals goes forward. WHY? Listed below are some of the reasons. 1. A huge number of artists are vying to license their work to a relatively small number of manufacturers looking for art. Thus, manufacturers have lots of art to select from and they consider MUCH more art than they can possibly use for their product lines or for presentations to retail chain stores. Because manufacturer art directors have so much art to consider they often do not inform the artist on the status of their art until or unless they intend to license it. Note: Artists that create licensable art with a special twist or emotion that catches the attention of art directors are the ones that get the deals. 2. Art may not be looked at immediately but stockpiled for a later decision on whether to license the art. For example, at the May 2012 Surtex show manufacturers most likely had already chosen Christmas art for the 2012 holiday season and may even had chosen art for the 2013 season. So the art they were considering was for the 2014 season and may not be decided on until the last quarter of 2013. However, it usually does not take that long if the timing is right but still it can take longer than anticipated. 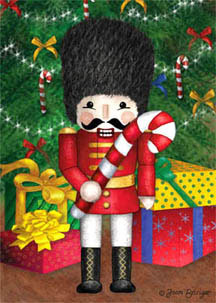 I had interest in the nutcracker art (shown at the top of this article) for a decorative flag in January 2010. I did not hear from the manufacturer until they decided to license it 11 months later (December 2010) for the 2011 Christmas season. 3. Pre-selling art on products before it is licensed is increasing each year especially to retail chain stores. If the art is intended for use in a presentation, it can take months before the presentation is scheduled and for the retailer to make a decision. And if the presentation is not just for several individual products to be shelved with others but for a batch of packaged products to a big box chain store, it can take even longer. Many presentations may stretch over several months and in the long run the manufacturer may lose the deal to another manufacturer. So if the artist's work is part of packaged products, there are two hurtles to overcome. The manufacturer must first get the deal and second, the artists work must be wanted by the retailer so that it is incorporated into the package. Note: During this long involved process, the artist may not even be aware that her/his art is being considered. 4. Circumstances in using the art may have changed by the time the manufacturer is ready to make a decision. • The art may no longer be on trend. • The art director that asked for the art is no longer with the company and the new one is not interested in the art. • The company policy has changed on the type of art and art style it wants or the company goes out of business. So what can artists do? The following are some suggestions to increase the chance in getting licensing deals. 1. Have a huge body of work so that many pieces of art are chosen for licensing consideration which increases the chance in getting deals. For instance, if an art director requests 20 designs be sent for licensing consideration, the artist has a better chance in getting a deal for at least one design than if only one design was requested. 2. Enhance your portfolio by having an excellent variety of art themes that are popular with consumers. Read "Art Licensing Editorial: List of Recent Trends" to see a list of some themes that are popular. 3. Continually stay in touch with art directors and often send new work. The more familiar art directors are with the artist and her/his work the better the chance in getting deals. Read "Art Licensing Tip: What does follow-up really mean?" 4. Contact art directors to find out when they are interested in considering different themes of art such as everyday, fall / Halloween, winter / Christmas, and other holidays. There is no standard time of the year to submit different art themes. Each manufacturer has their own time frame. 5. Contact art directors to find out if they send out requests for art (call-outs) and ask to be put on their list. Participating in call-outs is an excellent way to find out what kind of art themes manufacturers are seeking and when they want them. For more information on call-outs, read "Thoughts on doing CattleCalls - Should You?" Note: The words "cattle calls" originated with the motion picture industry when the studios sent call-outs for auditions. Be aware that not hearing back from manufacturers after they request art is just part of the business and requests for art may not result in always getting deals. Take note on what art themes manufacturers are interested in and create more. Most likely other manufacturers will also be looking for those themes. Create as much new licensable art as possible so manufacturers will have a large selection of art to choose. Be persistent and continue to follow-up and stay in touch with art directors. And most of all do NOT give up! Thank you Joan! Fantastic information and great insight to how the selection process and waiting time works. Great site!! Wonderful post very honest and informative. Thank you! Valuable information, Joan! Thank you! Thank you Joan for this very informative article. I've experienced this with manufacturers and it's nice to learn I'm not the only one! PERFECT timing for me, Joan! Thank you so much!! This was great info and very timely! Thank you, Joan! Wow, my friend shared this with me and I'm hooked, Joan. Thank you for this frank and thoughtful article. So helpful.